The island of Phuket is one of the most popular destinations among tourists in Thailand. When choosing a hotel on the island, you first need to determine the beach. It is from the beach and the hotel will depend on all the rest. Best and popular beaches in Phuket located on the West coast of the island, many of which are included in the list of the most popular beaches of Thailand (Naithon, Bang Tao, Surin, Kamala, Patong, Karon, Kata, Kata Noi, Nai Harn, etc.). Karon - one of the longest of Phuket's beaches (about 3 kilometers). On the beach is fine and pleasant to the touch the sand is light Golden brown. The main feature of Karon beach is the "singing sand", that squeaks underfoot when you walk, Recalling the crunch of the snow in dry winter day. Karon – developed and quiet residential area and the beach. On the beach there is all necessary infrastructure. Near the beach there are two markets, there are shops, plenty of cafes and restaurants ranging from local cuisine, ending European and Russian, also bars open until three in the morning and the abundance of accommodation facilities. The choice of accommodation in Karon beach is very large and diverse. Here are various range of hotels, guesthouses, villas and apartments, from budget to luxury and respectable. All accommodation facilities on Karon beach and close itself, you can view and book here. Kata perfectly combines everything you need for a comfortable stay. There is a wide sandy beach, stretching for a distance of over a mile along the sea, and all the necessary tourist infrastructure, providing a platform for active day and night life. 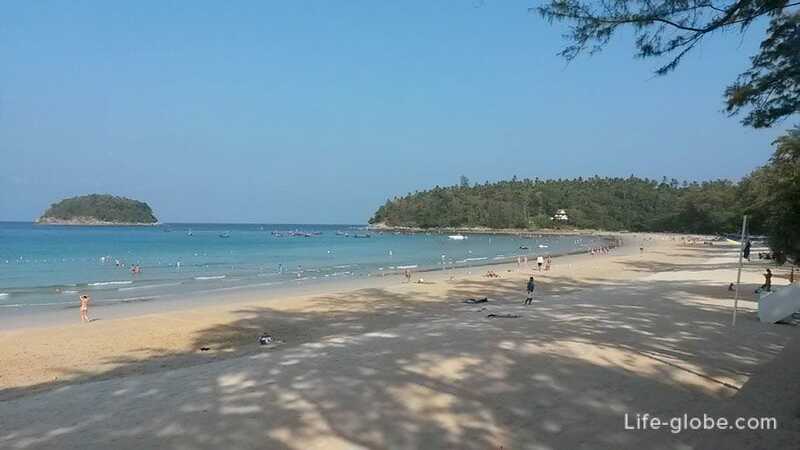 Kata beach with fine and white sand, has a convenient location, on the one hand it is adjacent to more developed and close to Karon beach, and on the other, with a small, but cozy and quiet Kata Noi beach. Close to Kata beach, located famous on the whole island attractions as the Big Buddha and the viewpoint Karon View Point, which offers stunning views of the beaches of Karon, Kata and Kata Noi. The choice of accommodation on Kata beach is quite large, here, as in Karon, presents various range of hotels, guesthouses, villas and apartments, from budget to luxury and respectable. The best apartments and hotels, to our taste, located on the hill between Kata and Kata Noi. Here at home, immersed in the greenery, and the absence of a number of tourist life creates peace and quiet. All accommodation at Kata beach and close itself, you can view and book here. Kata Noi is a small, but very nice and cozy beach. On the beach, even in the high tourist season, not as crowded as the more famous and visited beaches of Phuket such as Patong or Karon. The length of Kata Noi beach is just 600-700 meters, but the beach is wide enough. The beach itself is sandy, the sand is not to say that white, but not yellow, and the touch is very soft and tender. In our opinion, this is the best beach of Phuket. Photos of this beach you can see many advertising brochures and brochures. This beach is ideal for a respectable peaceful stay. The 5-star Katathani Phuket Beach Resort. Green territory of the hotel where there are bars and restaurants, sun loungers and pool, directly overlooking the beach. Apartments Kata Beach Kata Gardens with two swimming pools and a fitness center. 5-star resort Shore At Katathani. It's not even a hotel, and detached villas located on the hillside, giving stunning views of the sea and the beach from the terraces of villas. The price of each fork includes Breakfast. Of a budget: the 3-star Katanoi Resort and the 2 star Katanoi Pavilion by Amorn. 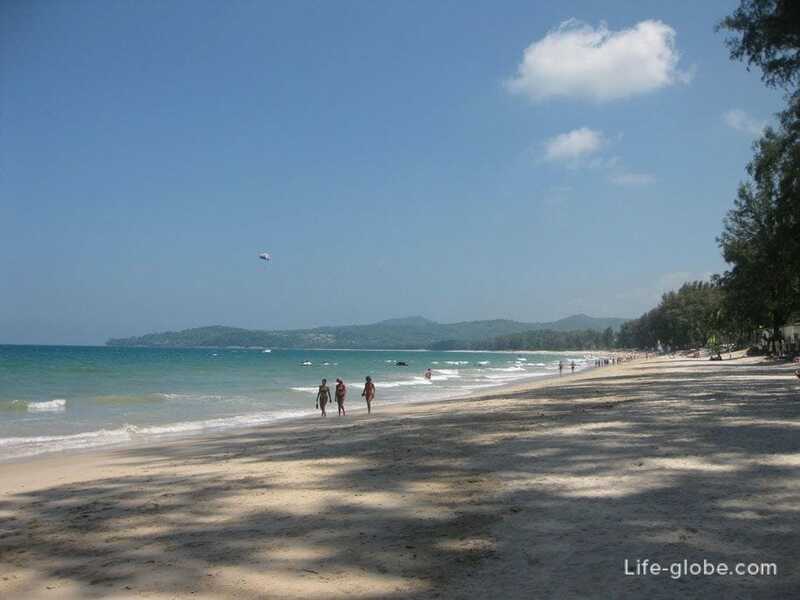 Patong is the most popular and happening beach in Phuket. It was on this beach come the bulk of tourists heading to the island for a tourist trip. Patong is a legendary Bangla Road, which is almost all day full of life. Currently Patong is the largest resort of Phuket, is a city. It is called the capital of the tourist life of the island, there is beach, and lots of various cafes, restaurants, bars and night clubs. Patong beach is quite long and wide. The length of the beach is 4 kilometers, here is where to relax, walk and play sports. The beach is always crowded. The coastline is sandy, the sand is a nice white color, shimmering under the rays of the sun. In Patong there is accommodation for every taste and budget. Here is how the budget hotels, luxury villas and apartments. All accommodation in Patong can view and book here. The famous Bang Tao beach is the longest beach of Phuket. The beach Bang Tao stretches for 7 kilometers. The beach has a wide sandy coast where, even in peak season is not as crowded as other, more "turisticheskih" beaches of the island. Due to its length the beach is great for relaxing and for sports. On both sides the beach is surrounded by green hills and between the hills the beach is framed by coniferous vegetation, which gives good shade from the midday sun. 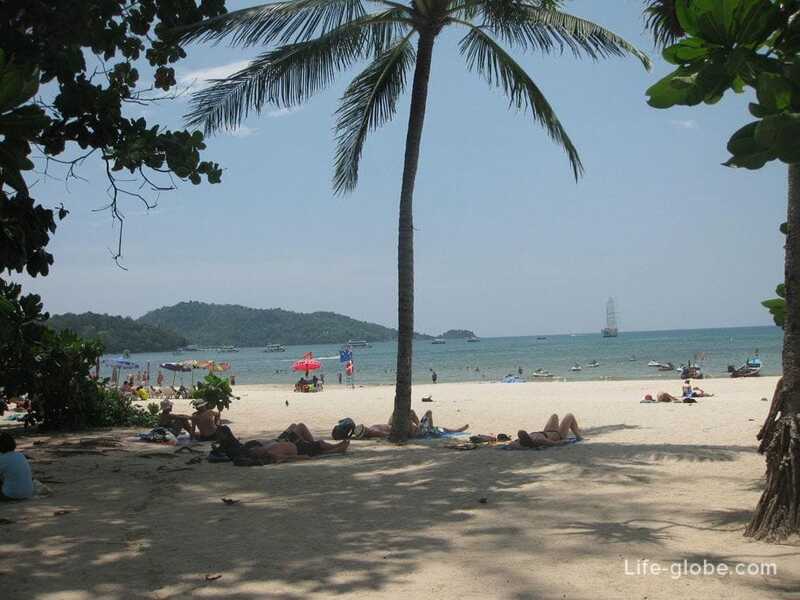 At this beach prefer to stay with those who came to Phuket for a sufficiently long period. More developed southern part of the beach, there is affordable housing, and on the beach - cafes, tents with refreshments and snacks, as well as massage parlors. The resort 5-star Outrigger Laguna Phuket Beach Resort. Offers as the number of the high-class private villas. Breakfast is included in the cost of each rooms and villas. The resort 5-star Mövenpick Resort Bangtao Beach Phuket, has earned guest rating fabulous, situated a short walk from Bangtao beach. It offers an infinity pool with a Spa pool, a health club and luxury suites with kitchen and balcony. Room rates include Breakfast. The 5-star, amazing rating, but for less money - Dusit Thani Laguna Phuket. The hotel has an outdoor pool and a Spa with a full range of services. Modern Thai-style rooms feature balconies overlooking the lagoon or the sea. More budget accommodation is located in the southern part of Bang Tao beach, a 5-10 minute walk from the beach. All accommodation in Bang Tao, you can view and book here. Surin beach is located in the Central part of the island on the West coast of the Andaman sea of the Indian ocean, between the beaches of Bang Tao and Kamala. On both sides the beach is separated green hills (capes), near which there are stones, sometimes large boulders, around which you can snorkel. The beach itself is small, a length of about 1 kilometer, but it is quite wide and sandy. The sand is fine and pleasant to the touch, yellow-white color. The beach is beautified and landscaped. In search of shadows you can rent chairs, mats and sun umbrella. Of the benefits of beach - along the beach does not pass road. Bluesiam Villa, with a private pool. Villa Napalai Surin Villa - an elite haven, you can enjoy a sea view. It offers an outdoor pool and free private parking. Surin Beach Villa 3 bedrooms with private garden, free Wi-Fi throughout and free private Parking. 5-star resort Twinpalms Phuket. The rooms and suites are equipped with a home cinema and a TV with cable channels. The bathrooms have a rain shower. Extras include a refrigerator with fully stocked Minibar and daily Butler service. The 4-star Manathai Surin Phuket. It offers a pool in the courtyard, free Wi-Fi and an exclusive restaurant. 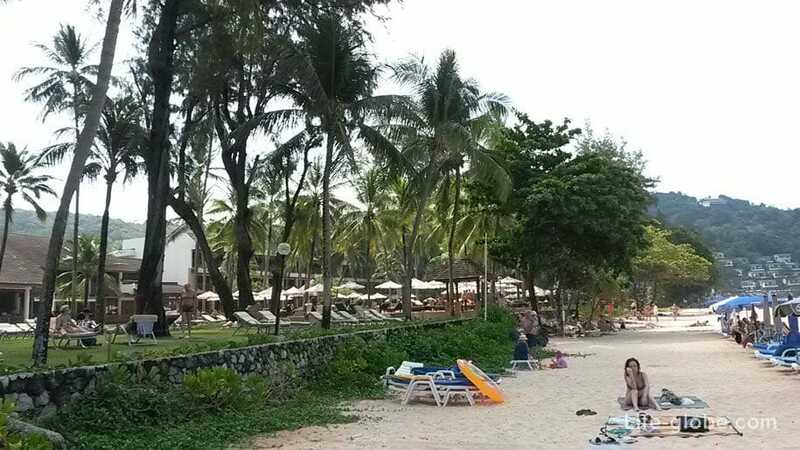 More budget-friendly 4-star Novotel Phuket resort Surin Beach. All rooms with private balcony, a DVD player, a fridge and an electric kettle. From budget 3 star Surin Sweet Hotel and Benyada Lodge - Surin beach. All accommodation in Surin can b viewed and booked here. 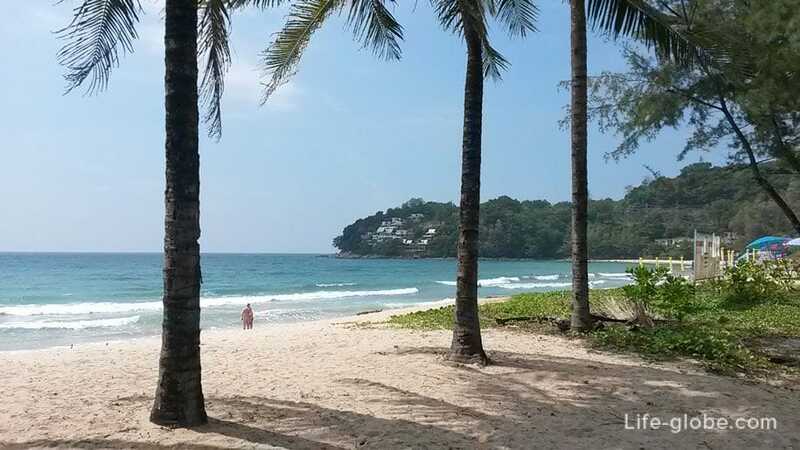 Kamala beach is also referred to as a source of harmony, beauty, nature and relaxing atmosphere. Immediately behind the beach is the roadway of the road, which gives extra peace. 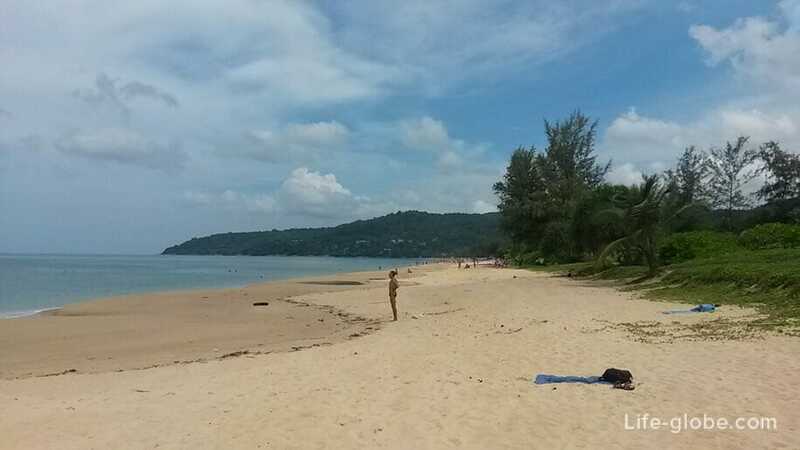 The coastline of Kamala beach is about 2 kilometers and a maximum width of the beach is about 20-30 meters. Due to the fact that the beach gradually turns into a promenade, visually, the beach seems much wider. For more quiet relaxation and sunbathing is the beach side. Here is a 4-star Hotel Novotel Phuket Kamala Beach. The Central part of the beach has all the necessary beach facilities: WC and shower, sun loungers and parasols, beach-water activities, and close proximity to cafes and restaurants. 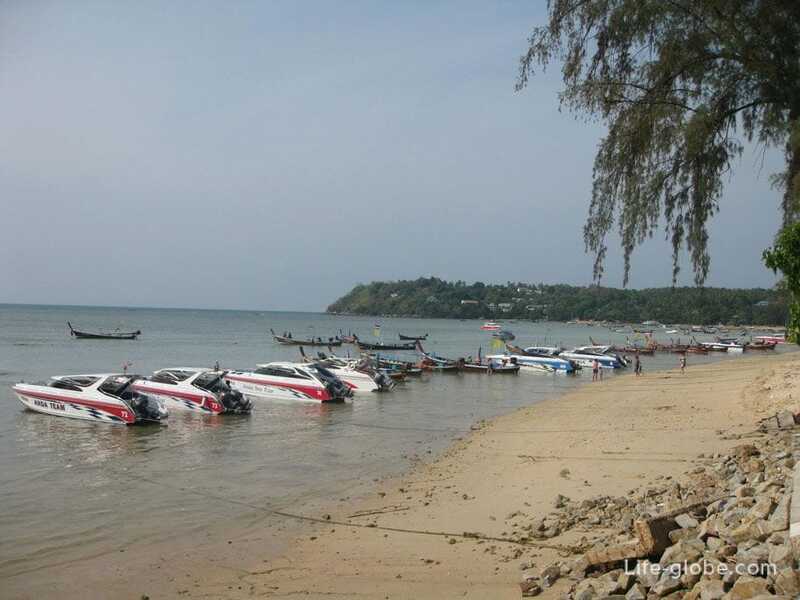 The southernmost part of the beach is not suitable for a beach holiday, it's more "wild" place on the coastal area is dirty and a handful of boats. Close to Kamala beach and a large variety of accommodation, ranging from the most expensive and respectable 5-star hotels and ending with budget hotels and guest houses. All accommodation facilities to the beach, you can view and book here. 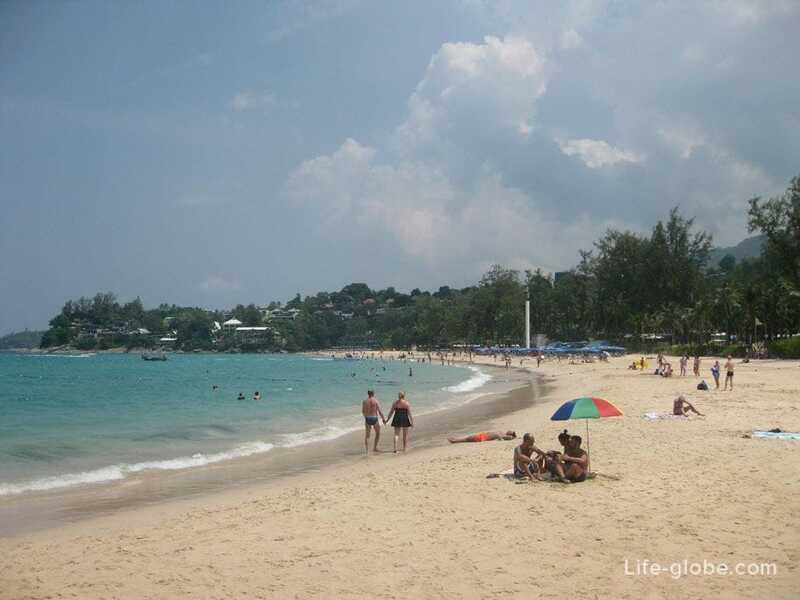 Nai Harn beach - one of the southern beaches of Phuket, located between Kata Noi and Yanuy. Almost adjacent to the Ao Sane. 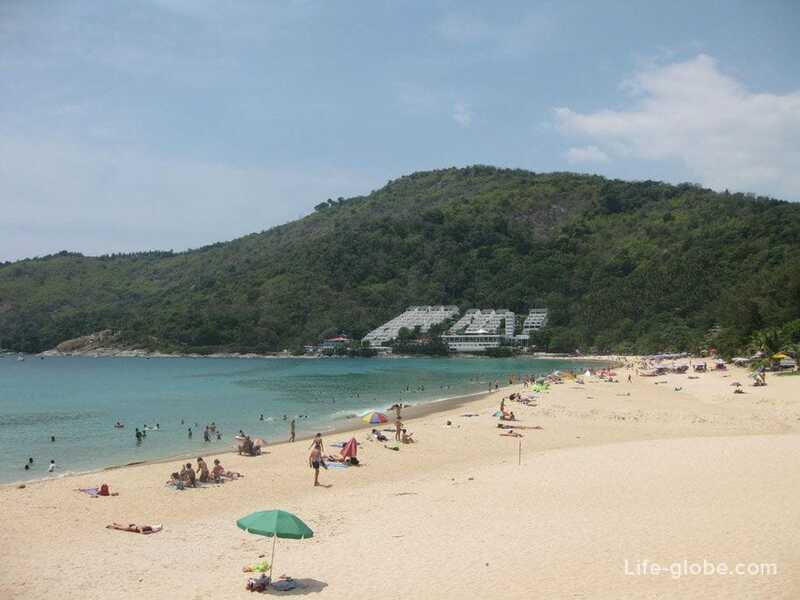 At sea water color, salinity, and purity, Nai Harn beach is comparable to Kata Noi beach. For many tourists, this beach becomes the beach of your dreams, incorporate all the attributes of a serene beach holiday. 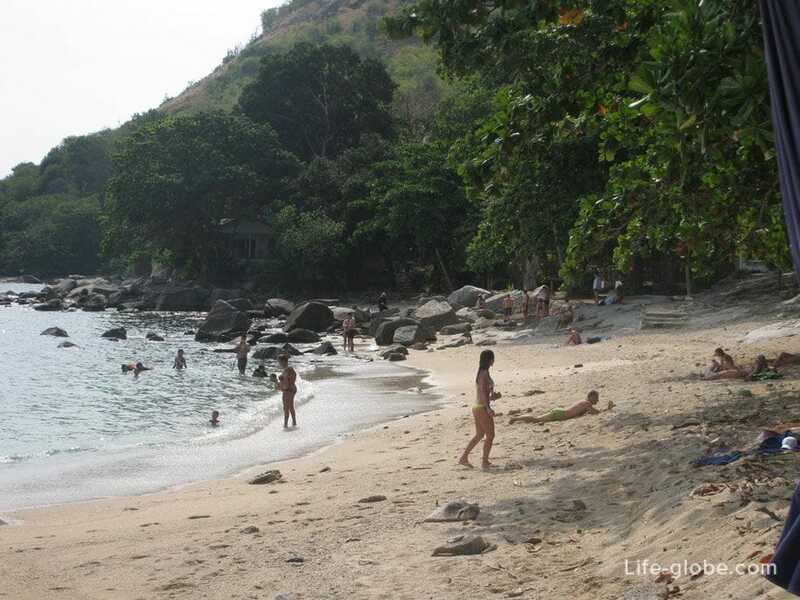 Nai Harn beach is a closed Bay surrounded by greenery. The picturesque mountains that surround the beach on both sides, combine perfectly with the azure waters of the Andaman sea. All this makes the beach secluded and beautiful. The coastline beach is smooth and sandy. The sand is a nice light color, the sun plays Golden notes. 5-star Nai Harn, located on a tropical hillside beach. The hotel offers scenic views of the sea and the beach. It offers comfortable rooms and suites with spacious balconies overlooking the sea. The 3-star All Seasons Naiharn Phuket is located 1 minute walk from Nai Harn beach. It offers rooms with garden views or ocean views, 2 outdoor pools, and 5 restaurants and bars. Room rates include Breakfast. Deluxe Villa Rock Pool. It offers 8 bedrooms, a fully equipped kitchen, private pool, Spa area and tropical garden. The Villa is located approximately a 10 minute walk from Nai Harn beach. The rest of the hotels located a little further from the beach, behind the lake. 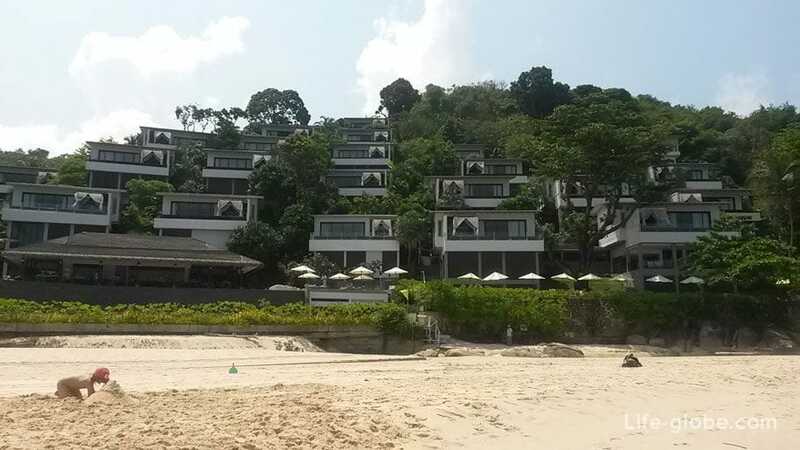 All accommodation on Nai Harn beach you can view and book here. 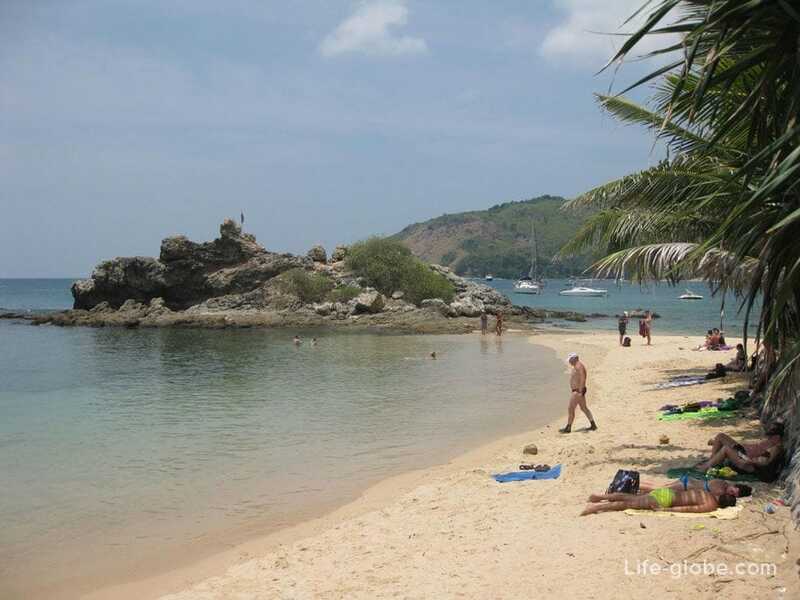 The Ao Sane is a small beach located in the lagoon on the South West coast of Phuket. Although this beach can boast of its size, it stands out compared to other beaches on the island. The hallmark of the Ao Sane is the fact of concealment of the beach from prying eyes - a secluded beach hidden in a forest of jungle. The beach strip of Ao Sane is quite narrow, here is a large yellow sand mixed with stones ranging from small to large boulders scattered around the perimeter of the beach. Hotel Naiharn On The Rock. It offers free Wi-Fi and a swimming pool. Resort Baan Krating Phuket Resort. The hotel features a restaurant, an outdoor pool and free Parking. Air-conditioned rooms feature Internet access, satellite TV, private terrace with views of the ocean or the forest. You can also stay at Nai Harn and Ao Sane to walk, the road will take about 10 minutes of slow pace, a distance slightly more than a kilometer. Yanuy a small southern beach of Phuket, located in the Bay between the rocks, and geographically, between the beaches of Rawai and Nai Harn. Yanuy beach is very picturesque, coming down to the beach from Rawai beach, the town offers wonderful seeing Yanuy beach and the surrounding area. The length of Yanui beach a little more than 100 meters. In peak season the beach is crowded, and more low season tourists becomes less. Visually the beach is divided into two parts by a small rocky ledge, like a small islet connected to the beach of the land. The hotel's Sense of Yanui with a private garden. The beach can be reached within 3 minutes. Some rooms have a terrace and/or balcony with mountain views. The 4-star The Windmill Phuket Hotel features an outdoor pool and a restaurant. It offers free Wi-Fi and a Spa. Room rates include Breakfast. Guest house Yanui Beach Hideaway with a restaurant and free Wi-Fi. From the Windows overlooking the garden. Guests can use barbecue facilities and a bar. Naithon beach is located in the northwestern part of the island, at a distance of only 8 km. from Phuket airport. The length of the beach is just over 1 km. and width of about 50 meters. 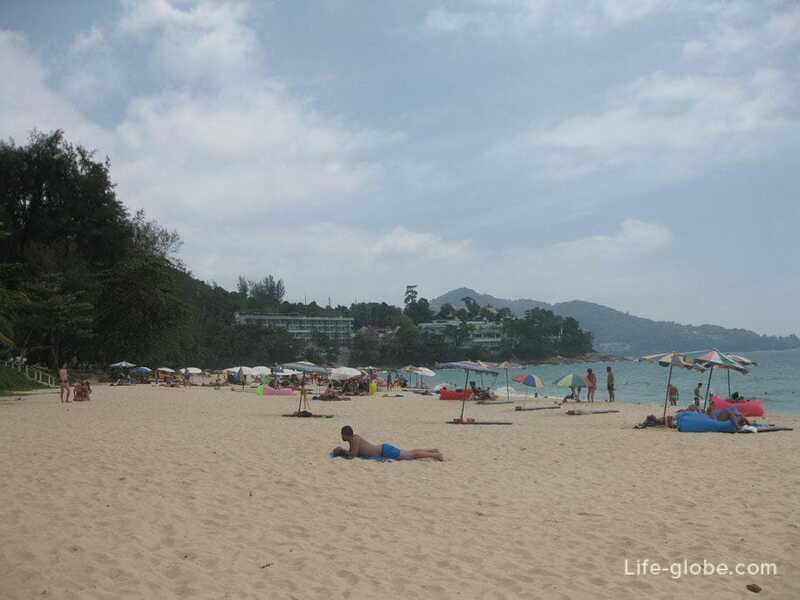 This is a very quiet beach, many vacationers include this beach to the best beaches of Phuket. On the beach the sand is light in color. The beach is surrounded by hills and tropical vegetation. The 4-star Pearl of Naithon complex. Apartment with a fully equipped kitchen and free Wi-Fi. Featuring a tour Desk, an outdoor pool and a fitness center. The apartments of Pearl of Naithon with free Wi-Fi. The apartments are equipped with air conditioning and a fully equipped kitchen with an oven, a microwave and a kettle. 5 star complex Malaiwana Villas - an elite haven. It features villas with a Seating area, a flat-screen TV, a kitchen with a dishwasher, oven and coffee machine and free Wi-Fi. For guests of the Villa can enjoy a continental Breakfast. Budget apartment Nai Thon Condo Unit 303. The apartment features mountain views, 1 bedroom, bathroom with shower and a kitchenette with a microwave and a toaster. All accommodation on Naithon beach, you can view and book here. Also among tourists very popular Rawai beach. This beach is akupavany, but stay in this part of the island will be somewhat cheaper than the popular and sought after beaches in Phuket, and the choice of accommodation is quite varied. Most of the beach is busy with boats and boats of local residents. The sea water is muddy, shallow and rocky. During low tide the water goes out pretty far, thus draining stony bottom, and at high tide leaves only a narrow strip of land. The beach itself is sandy, mixed with rocks, sand yellow. All accommodation facilities at Rawai beach, you can view and book here. Phuket town is the capital and largest city of the province of Phuket, located in the southeastern part of the island. 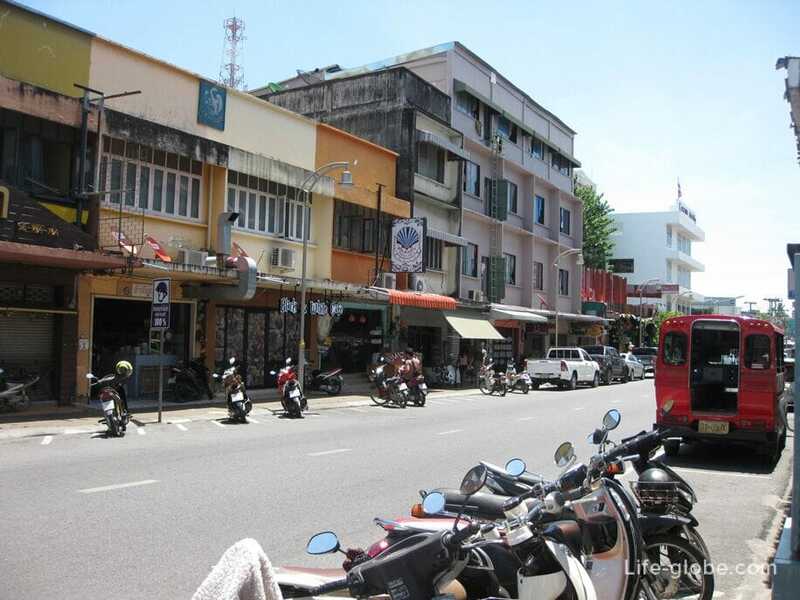 Many tourists come to Phuket town, primarily for the purpose of transplantation, traveling around Phuket by public transport, as many go to shopping. Choice of budget accommodation in Phuket town is large and diverse, especially inexpensive hotels and apartments, but the beaches will have to travel by public transport and(or) a rented car/bike. All accommodation in Phuket town you can view and book here.